Falls Creek Falls is a rather common sounding name for an incredible waterfall in the Mountain Bridge Wilderness in northern Greenville County. 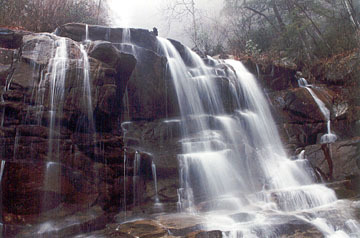 The 100+ foot falls are east of Jones Gap State Park on land protected by the Nature Conservancy. The 1.5 mile trail (blazed orange) has long, steep sections at each end with a chance to rest in the middle among house-size boulders. 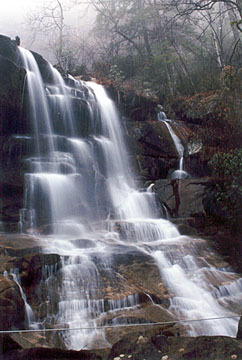 Although a tough hike, the cascades of Falls Creek and Little Falls Creek will serenade and energize you throughout the hike. You can catch a distant, wintertime view of the top of the falls from Falls Creek Road in front of the Palmetto Bible Camp. Jones Gap and Caesars Head state parks are part of the Mountain Bridge, a 40,000-acre wilderness preserve in northwestern South Carolina. 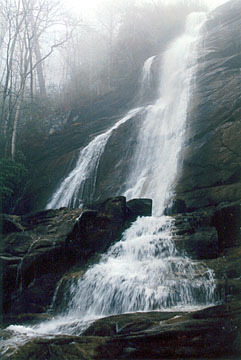 The Falls Creek Falls trail crosses at the base of the falls (with the aid of guide ropes and chains), connects with the Hospital Rock trail and arrives in Jones Gap State Park. This hike makes for a long and hard 7-mile hike. Directions: From Greenville/Travelers Rest, drive north on US 276 to its junction with SC 11. Continue on US 276/SC 11 for 1.5 miles and turn right onto River Falls Road (look for the F-Mart store at the intersection). Drive 4 miles to Duckworth Road and turn right (look for the Palmetto Bible Camp sign). Drive 0.5 mile to Falls Creek Road and turn right (look for another Palmetto Bible Camp sign) Drive 0.5 mile past Palmetto Bible Camp on your right and past a small, manmade waterfall on your left. Look for a small parking area with a set of stairs on the left in 150 feet. Park here if possible. Be sure to register before starting your hike. You will cross Little Falls Creek on stones at about the halfway point. Carefully watch the trail signs and blazes because the trail takes some sharp turns.